White stone, insanely blue water, and sun, sun, sun. The first stop on my spur-of-the-moment trip last month was Malta. If you look up the phrase “sun drenched” in the dictionary, you will find a picture of the limestone fortifications along the shores, or of the fields of tomatoes growing under the Mediterranean sun. Indeed, the bright sun and noon hour conspired against my photography (I’m a rank hobbyist, at best), washing out my pictures but also capturing the brilliance. The first thing we did was grab the first available hop on-hop off bus, which was headed to the old city of Mdina (em-deen-a) and the church of St Paul (supposedly where Paul landed on one of his many shipwrecks, around 58 BE, and converted the pagan people of Malta to Christianity). There is a grotto where he is supposed to have lived, and many plaques and signs regarding Papal visits and the holiness of the place. 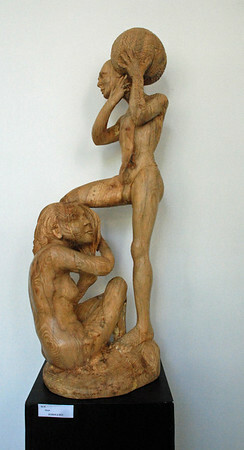 A local artist also had a showing at the museum attached to the church. 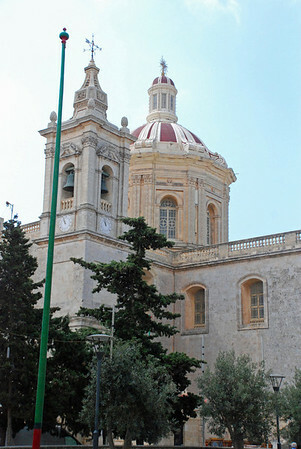 he big church attraction in Malta is actually the Co-Cathedral of St. John, built by knights of the Order of St. John (who became the Maltese Knights, of course), relocated from their chores during the Crusades, and ruling Malta for nearly 300 years. My research showed that the place is knock-down gorgeous and insanely ornate, gilded, and complete with Michelangelo’s painting “The Beheading of St. John”. I’m sure it was beautiful, and if I had been there several days, I would have paid a visit. However, I get queasy when I think about how much money was spent over the centuries, how much peasant labor and meager resources spent, to build these places. 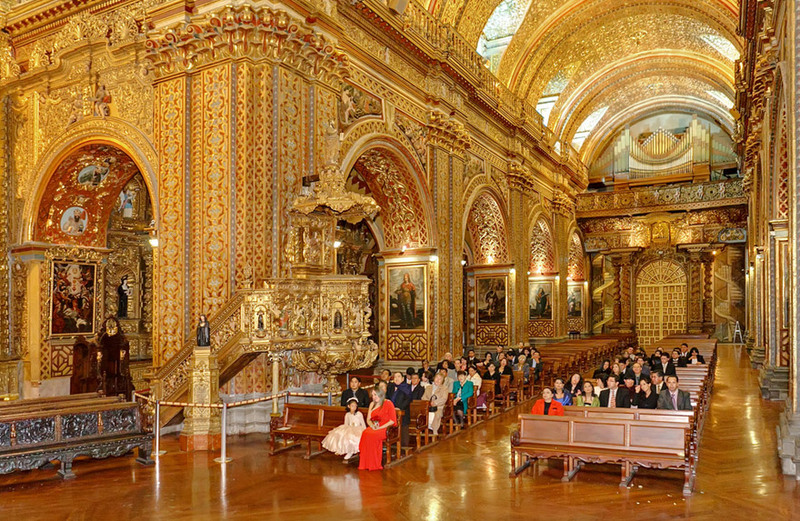 The poorest places seem to have the fanciest churches (like Quito, for instance). 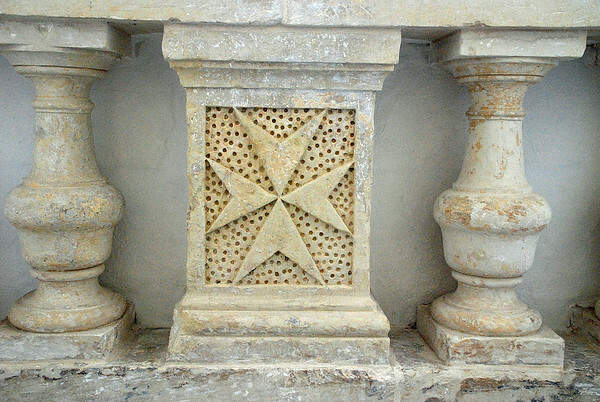 We frequently spotted the famous Maltese Cross adorning buildings. 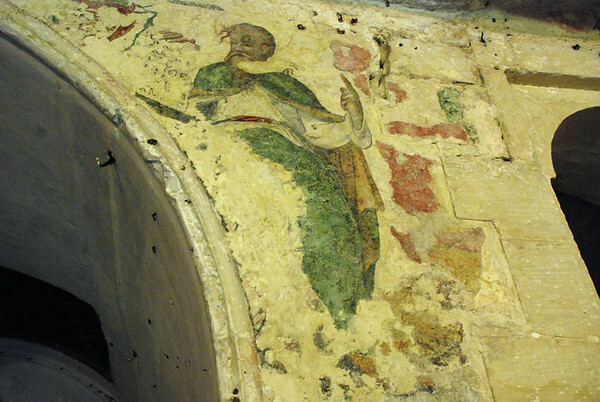 This one appears on an old wall within the church. 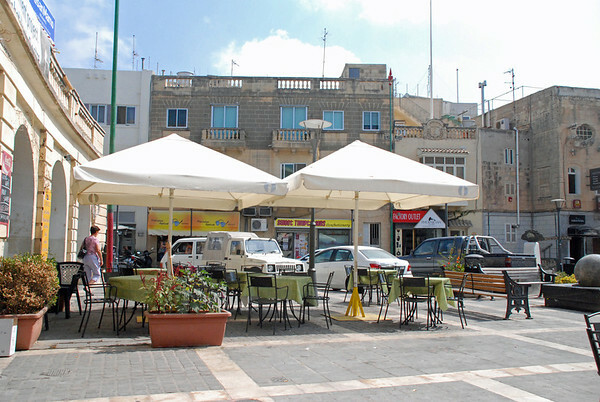 Sight-seeing is thirsty work, so we stopped at the first cafe in Mdina we found that advertised free wifi. Thus refreshed and having our connectivity fix, off to see more of the city! The cafes were inexpensive, and under air-conditioned as well. 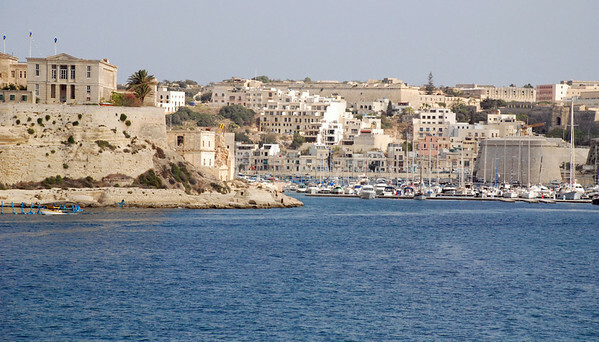 Here is 6000-plus years of history, collapsed into three paragraphs: Sailors are known to have landed at Malta as far back as 4500 BCE, at time referred to as “Ghar-Dalam” (which apparently is in no way related to Middle Earth). During the subsequent rule by the Phoenicians, the early Maltese were trading partners with nearby Sicily. It become part of the Roman Empire after the Punic Wars. Paul is supposed to have been shipwrecked hear around 58-60 CE, where he converted the local population into one of the earliest Christian communities. Malta was part of the eastern Roman empire, and as the Empire collapsed in the 5th century, the Vandals occupied Malta. About 870 CE, the Arabs conquered and ruled Malta, until they were overthrown by the Normans in 1090 CE. The last of the Arabs were expelled in 1224. Malta bounced around as a subject of German states, Sicily, the Ottoman Empire, and Spain, until it was ‘awarded’ to the Order of St . John in 1522 CE, after those knights had to leave the Holy Land post-Crusades. The knights ruled the island, not always benevolently, for 268 years. Their main objective, besides maintaining the cult of St John, was to repeal Muslim invaders. They stayed in power until Napoleon conquered the area in 1798, but the British successfully, and with Malta’s blessing, tossed the little guy two years later. In more modern history, Malta was a major base for the British army during the Crimea War, and was important to Allied Forces during the two World Wars. It became an independent country in 1964, retaining the English language as well as their native Maltese language (a derivative of Arabic). Malta is self-sufficient in most produce and fish, and chicken and rabbit are their primary meat sources. One of the main industries here is airplane repair, as it serves as a major repair center for the airlines from all over Europe. Our guide talked about the Malta coast guard, whose main functions include harbor patrol, search-and-rescue, and dealing with large-scale illegal immigration. Fun fact: The Order of St John was also known as the Knights Hospitaller, from which we get our hospitals and hospitality. The Order still exists, but now it’s known as the St John Ambulance Association, and its badge is still a Maltese cross.